Now that iOS 10 public beta is available to install for anyone, users can run the beta system software on any compatible iPhone, iPad, or iPod touch. 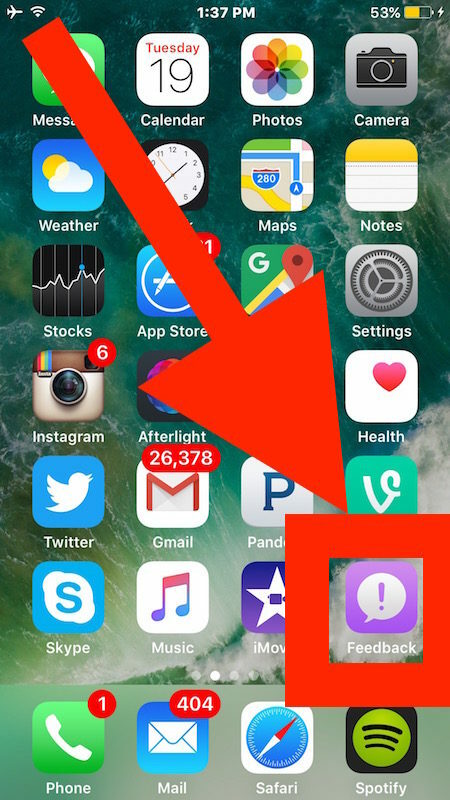 Of course since it’s beta software, users may encounter bugs, or there may be behavior that is generally unexpected or could be improved upon in the iOS 10 betas. 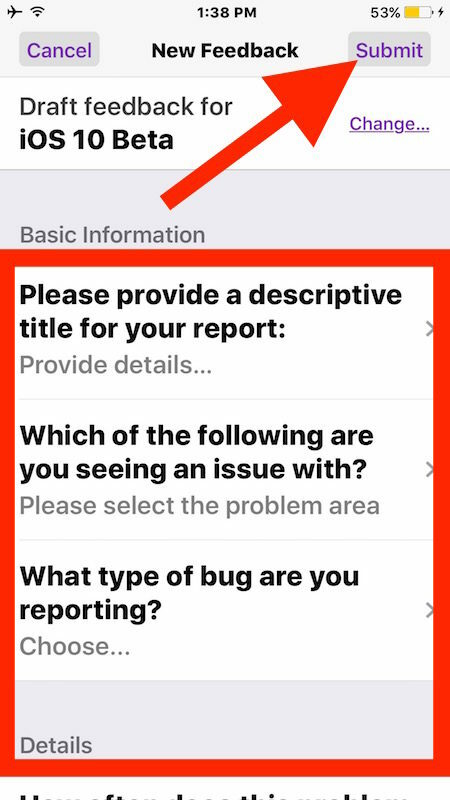 Rather than just being annoyed, beta testers can do their part to improve iOS 10 by reporting bugs directly to Apple. Additionally, the Feedback app in iOS 10 Public Beta can be used to offer general feedback about iOS 10 to Apple, offering the beta tester the potential to help shape the next major iOS release. Remember, when filling out bug reports or offering feedback about an operating system or experience in iOS, be as specific as possible. 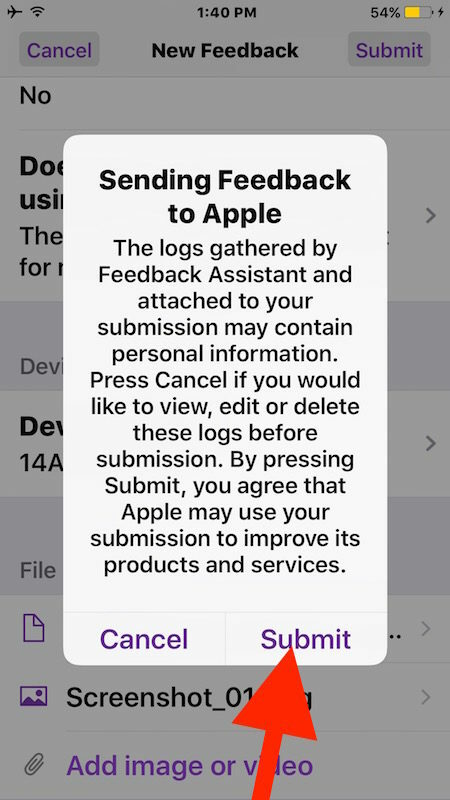 If you are attaching logs and other details, a confirmation dialog will come up asking you to confirm that you don’t mind submitting some details about the device and potentially other personal information with the bug report. You can remove the logs and re-submit the feedback if you do not wish to include that data. That’s it! Your bug report or general feedback has been sent to Apple, where it may be reviewed and, with any luck, the problem reported will be fixed. 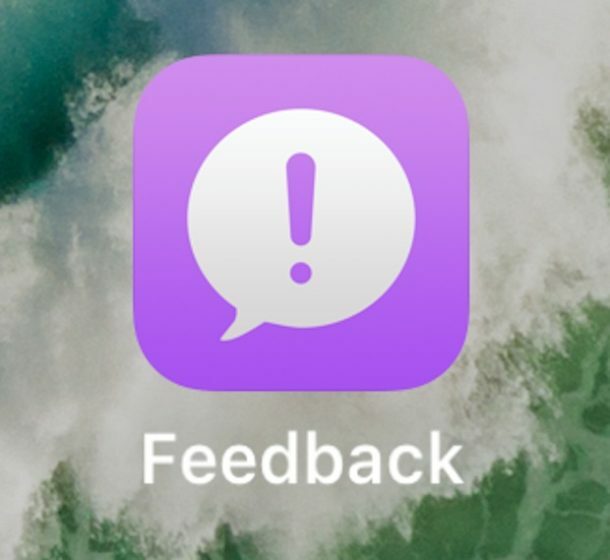 The Feedback Assistant app includes an inbox, drafts, submitted, and outbox folder, where you may get some communication from Apple either about general beta announcements, or perhaps even about a specific issue or feedback you submitted. 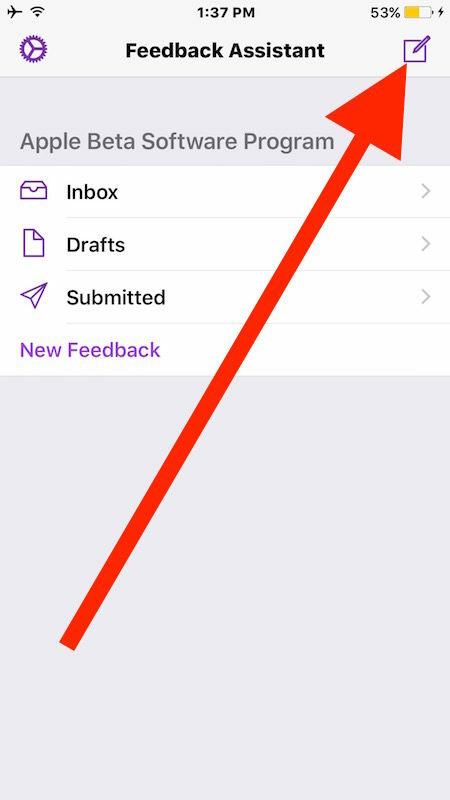 Remember, as you participate in the public beta program and use iOS 10, don’t forget to submit feedback to Apple using the Feedback app! Oh and on a quick side note, if you discover the beta experience is just too buggy to be tolerable for whatever reason, you can downgrade iOS 10 back to iOS 9 as described here. I can’t stand the new lock screen of iOS 10. I hope they give us “swipe to unlock” again as an option because the new iOS 10 lock screen is bad user experience. I too would like the Swipe To Unlock feature to return, though you can now (as of this 3rd beta) set the Home button to unlock your phone without actually pressing it, just by touching it (provided you’ve got TouchID enabled). I hope you are filing reports and sending feedback about these features you wish to change, if you don’t let your voice known directly through the feedback mechanism than nothing will change! Anyway, I agree, I don’t like the new lock screen behavior at all in iOS 10. I want to enable Slide to Unlock in iOS 10 for the lock screen, and swipe for camera access in iOS 10. Kirk, if you swipe the screen left, the camera app opens (i6 Plus). But the lock screen behaviour is good. If your fingerprint isn’t recognised, then use your passcode. So simple and works perfectly good. And yes, I posted my suggestions, rants, raves and otherwise pestering comments on the Feedback app. We need to report everything thus we can reach our aims to change something. But Uglystaff, what do you think, how could to use the swipe in other apps?!? Maybe in safari (to revert back to previous page)?! I think, the swipe option to unlock is not necessary anymore, because with swipe gesture we can reach other useful feature (to right the widgets, to left the camera, but on widget side the search feature is available); pretty cool solution. iOS 10 is perfect, iOS is perfect comrade, there is nothing wrong with any of it, it is perfection perfected. All hail iOS 10, it is the best most perfect creation from Apple ever. It will only be surpassed by iOS 11 in its perfection. The user is the problem, comrade. The user is always the problem. You are holding it wrong. You are installing iOS wrong. You are using it wrong. You are doing it wrong, it is your fault if iOS 10 does not perform perfectly for you. You must visit a reeducation camp and learn how to glory in iOS 10 like a true believer. iOS 10 is the best, it is perfect. Thank you Lords of Apple for iOS 10, it is the highest glory. I was thinking about being able to return to Homescreen withouth having to use the Home button, for example. Jailbreaking your phone will let you install tweaks that let you do that: you can, for example, swipe the notification area right, or left, to achieve that, or double-tap it, or what have you. There are also tweaks that wil let you switch between the last two used apps via swiping gestures: that’s nifty when you are using, say, Safari to search stuff, and posting said stuff on Twitter, for example. Generally speaking, I wish Apple would force iPhone users to use the Home button all the time, given its propensity to become inoperable over time. Hey, good people at osxdaily, how about an Edit button in your comment section…? I can’t seem to open my phone unless I use Siri, which is a nightmare. After half an hour, I turned Siri off. Otherwise it just goes to Voice Control and I can’t access my phone. Oh, I see. It’s a different way to open it. Apple should warn you about this. You press on the Home button and it unlocks (notice at the top of the screen), then you press again and it opens the phone. You press on the Home button and it unlocks (notice at the top of the screen), then you press again and it opens the phone. i like the new stopwatch look, i just hope they added a way to start it without clicking on the screen like the volume button just like the way they did on the camera. just a suggestion. After the public release, my feedback assistant dissapeared. Still running the beta profile. Still have a couple apps that won’t update, and can’t use. Everything I use daily lags, and I can’t report it. iOS 10 is lucky to get a sub par rating for me. Major disappointment. I have submitted 30 bug reports since the beginning of iOS 10 public beta. It has consumed 12 gb of my storage space on my 6s Plus. There’s apparently no way to delete the submitted reports. I’ll have to delete the profile to get my storage space back.